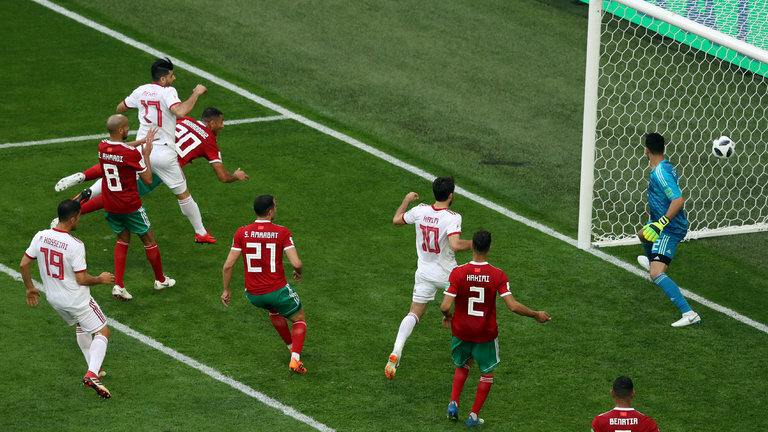 Lucky Iran just won its World Cup opener against Morocco, 1-0. How lucky, as lucky as a last minute own goal in added time. Trying to clear a last-second ball across the goalmouth, Aziz Bouhaddouz of Morocco dove for a header, and the ball went unerringly into the corner of his own net. Well, both teams, especially Iran, engaged in a great deal of physical play, and numerous players from both sides hit the turf with injuries throughout.